Jorge Hachiya Saeki received his JD degree from the Law School of the University of São Paulo (USP), in 1982 and was admitted to the Brazilian Bar in 1983. 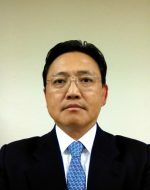 His background includes working in legal departments of Japanese companies in Tokyo and tax counselling in international audit company in São Paulo, before joining Saeki Advogados in 1988, where he presently is the managing partner, responsible for the international issues, foreign investments, corporate and tax law areas. Fluent in Portuguese, English and Japanese, he is the General Counsel of the Japanese Chamber of Commerce and Industry in Brazil and legal representative of dozens of foreign companies in Brazil. The firm has a large experience of more than 35 years counseling and attending hundreds of foreign companies establishing their business in Brazil through subsidiaries, agents and distributors. Its activities comprise the formation of subsidiaries (full assistance and representation of foreign shareholders in the establishment and all subsequent registrations of the subsidiaries, as well as expatriate´s work permits, visas and personal registrations) and further legal counsel in all areas of law, including the recently formed team for contract management (drawing of workflow for contracting, compliance and governance rules, application of lean office principles in the procurement rules, and adoption of filing and control system), and litigation in general. Saeki Advogados is a full service boutique law firm and its professionals are highly specialized in several areas of business law in Brazil, representing clients in a wide range of matters, from simple everyday transactions to complex and sophisticated deals, with a unique level of excellence in the legal market. Saeki´s team is concise in number of lawyers but their background brings to matters global perspective and deep market knowledge, especially regarding the Japanese companies acting in Brazil. When talking about sophisticated deals, it is to emphasize Saeki’s lawyers have extensive experience in corporate matters working on behalf of Brazilian and foreign clients in cross-border transaction, assisting companies, executives and boards of directors in all aspects of the companies´ transactions, including the drafting and negotiating of contracts as well as full negotiation. With its full service structure, Saeki Advogados is able to draw and evaluate the complex juridical aspects of the companies´ operations. Saeki Advogados is mentioned in the “Yearbook 2011 – The 500 Most Admired Law Firms and Lawyers” of Brazil, where it appears in the list of Most Admired Law Firms per sector (Automotive), Most Admired Law Firms per Category (Corporate – Full Service) and in the list of Most Admired Lawyers per Sector: Jorge Hachiya Saeki, in Foreign Trade, and Michele Restum Haidar, in the Automotive sector.